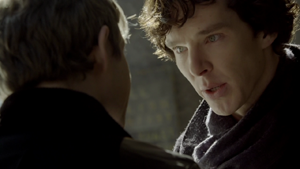 Sherlock Holmes is a genius making a name for himself as a Consulting Detective. 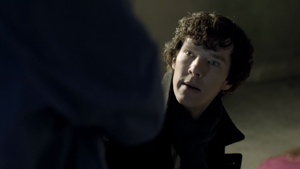 Holmes is introduced to an ex-army doctor named John Watson. After moving in together at 221B Baker Street in London, Holmes sees an intellect in Watson, and drags him along on a case. This modern-day take on Sir Arthur Conan Doyle’s classic mystery stories stars Benedict Cumberbatch as Holmes and Martin Freeman as Watson. 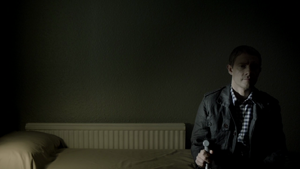 The series was created by Steven Moffat and Mark Gatiss who are perhaps best known for their recent work on Doctor Who. It’s easy to strike similarities between Holmes and The Doctor, and so it’s no surprise that it was these two writers who would find themselves taking the head of creative for both mythical men. While watching Cumberbatch1 in the role of Holmes, it’s hard not to picture him, and how great of a job he’d do as The Doctor. Freeman is best know for his role as Tim in the original Office. He also played Arthur Dent, the everyday hero from Douglas Adams’ The Hitchhiker’s Guide To The Galaxy. It’s interesting to see him here in a dramatic role, and he does an amazing job. The series consists of only three 90 minute episodes2. The pacing is quick, and it’s easy to sit down and watch the entire series in one go, as I did. Setting Holmes’ stories in modern day England is perhaps a challenge unto itself. Holmes never had to deal with CSI-style forensics, nor cellular telephones, but Gatiss and Moffatt do an excellent job. While there are some obvious references between the series opener “A Study In Pink” and Doyle’s “A Study In Scarlet,” the authors do an excellent job at creating a new Holmesian episode. Something that the Holodeck had a hard time doing3. For the uninitiated into the Holmes stories, you’ll find a great series, and a lot of fun. For those who have casually read Holmes4, you’ll find bits and pieces that are recognizable, and a portrayal of Holmes which is as good as it gets. For those who are Holmes fans, I think you’ll be pleasant surprised, as long as you’re not purists. Finally, the cinematic style of the story is fantastic. The directors did an excellent job at creating a great visual style. 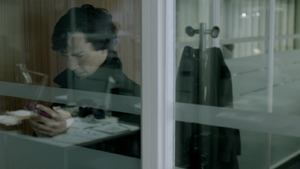 In the first episode we see everything that Holmes sees as the camera pans through a crime scene. We see on screen all texts, as pop-up text, rather than shooting a cell phone screen. So, in conclusion, watch it, stupid5!